Solve problems by independently applying their basic skills, including how to break down problems into a series of simpler steps and persevering in seeking solutions. Chance to both talk and think mathematically – with focuses on describing, explaining, convincing, justifying and proving their ideas and understanding. 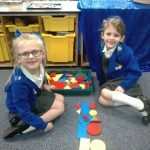 To enable children to do this we deliver carefully planned, exciting and engaging daily maths sessions where work is modelled and targeted support is given whilst maintaining challenge. All children must feel they have achieved in their daily maths session and can build upon their skills over time. Children need to demonstrate security in the skills they are practising and applying. We follow an established calculation policy that sets out the way children should solve all four calculations and this policy shows the progression throughout the school and on to Catshill Middle School as part of our Catshill Learning Community. We also run parent workshops on the calculations policy every year to share the methods and advise you on how to best support your child at home. Further to that we hope that our website will provide you with ideas, resources and websites links to help you support your child at home. Every year we run three parents’ workshops inviting parents into school to find out more about how we teach the four rules in school. 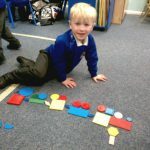 There are three workshops Early Years, Key Stage 1 and Key Stage 2. We use Times Tables Rockstars with Year 2 up to Year 4. Click below to go straight to the web page and rock along while learning your tables. Part of what we do in school to support times tables recall is the 99 Club. The children start on 22 questions in 10 minutes and work up to 154 questions. Below you will find all the clubs right from 22 to 154 and the answer sheets at the end. So why not have a go at home with your child?